All doing involves change and change requires some duration of time. Change means going from one event to another and the interval between the two events is time. We can experience action or doing only in the flow of time projected by the mind from past to the future bypassing the present moment. “Neither I live in vaikunTha nor in the hearts of yOgi. Thinking about that (athu chinthicchu) (truth about Bhaaratham)) all the living souls in the other thirteen worlds (lokangal pathimmunnilulla janangalum), those who are living in the other 6 islands (mattu dweepukalil aarilumullorum), those who are living in the other eight continents (mattu khandangalettilumullorum) and all who lived in the other three yugaas (mattu moonu yugangalilullorum), realizing that salvation is not possible for them (mukthi thangalkku saadhyamallaaykayaal), pay respect both to Bhaaratha and the Kalikaala or Kaliyuga with folded hands (kalikaalatthe, bharathakhanadathe kalithaadaram kaivanangunnu). What does “athu chinthicchu” or “thinking about that” mean? In the 27th Stanza poet reminds us: “Everybody should remember that this place known as Bhaaratham is such an important place. Out of the four yugaas, Kaliyugam is the best to attain salvation.” So thinking about these two factors, all the souls lived outside Bhaaratha varsha and all who lived in the other three yugaas paid respect to this auspicious time and this auspicious land. Other thirteen lokaas or worlds are :1. Sathya lokam 2. Thapolokam 3. Janalokam 4. Maharlokam 5. swarlokam 6. Bhuvarlokam 7. Athalam 8. Vithalam 9. Suthalam 10. Thalaathalam 11. Mahathalam 12. Rasathalam 13. Paathaalam. The first six worlds are above Earth and the last seven are below earth. Other six islands or dweepams are Plaksha dweepam, Shaalmala dweepam, Kusa ,Krouncha, Shaaka and Pushkara dweepams. Other six continents or regions are 1. Ilavrita Region 2. Bhadrasva Region 3.Harivarsha Region 4.Kethumaala Region 5. Ramyaka Region 6. Hiranmaya Region 7. Kuru Region 8. Kimpurusha Region. Other three yugas are 1. Krutha yuga 2. Thretha yuga 3. Dwapara yuga. Why all of them think that salvation is not possible or “mukthi saadhyamallaykayaal” in their time and place? Scriptures depict Dharmam as a bull or “vrusham”, and it has four legs in Krutha yuga (chathushpaadam). They are : Tapa, Soucha, Daya, Sathya or Religious austerity, Purity, Compassion and Truth respectively. In Krutha yuga people had all these qualities and Dharma was completely stable. All people were saathwic or pious and only through severe penance one could realize god. In Thretha, people have only three qualities except Tapa. Dharma was somewhat stable on three legs. One has to strive less than Krutha Yuga, but had to observe strict purity of mind and body along with compassion and truthfulness. They had to perform difficult yanjnaas and distribute their possessions with kindness. In Dwapara yuga people have only Daya and Sathya and Dharma had to balance with effort to survive on two legs. In this yuga also it was much harder to attain salvation than in Kaliyuga. They had to do Yaagaas like Raajasooyam, poojaas using different manthras and thanthras etc. 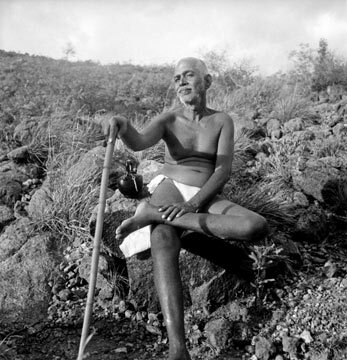 In Kaliyuga, only one leg is there for Dharma which is Sathya, and it is trembling insecurely on one leg. Kali encouraged by falsehood tries to destabilize the bull called Dharma. So why do they think that they cannot attain salvation ? They can actually attain salvation in any yuga. But the effort is many many times the effort or yathnam that one has to make in Kaliyuga. When compared to how effortless it is in Kaliyuga, they feel that it is impossible to get salvation in other yugaas. “Not possible” really do not mean that it is not possible but means that practically it is much harder to attain salvation. So they all desire to be born in Kaliyuga in Bhaaratha so that they can get salvation just by chanting Bhagava’s naamam. In other yugaas so much penance has to be done, so many Yanjnaas have to be performed along with daana (giving away ) and purity of mind and body has to be strictly observed. But in Kaliyuga, naamasankeerhtanam can be done anytime, anywhere, clean or unclean, knowingly or unknowingly and one can attain salvation by the power of Naamam. If we are truthful, Kali cannot do anything to us and Naamasankeerthanam helps us to be truthful and strong. Leading a dharmic life we can easily progress in our spiritual path by chanting namam and eventually attain salvation. But negative temptations are all around us and it is hard to resist those. But once we step on the ladder of Naamasankeerthanam, our upward journey to merge with Bhagavaan becomes safe and trouble free with the blessings of Naami (one who bears the naamam). They (people who are in other worlds) think: Oh God! (Daivame!) 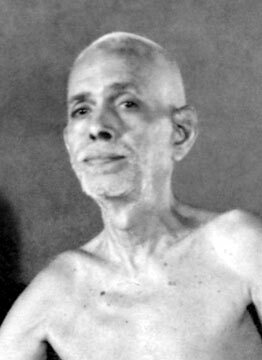 (we) are not lucky enough (thakkoru bhaagyam poraathe poyallo) to be qualified (yogyatha varuttheetuvaan) to be born even as a blade of grass (pullaayittenkilum) in that land (athil or in Bhaaratham), in this time (ithukaalam or Kaliyugam), (we) do namaskaaram to both the people who are born in Bhaaratha varsha (bhaaratha khandathinkal pirannoru manushyarkkum) and to Kali himslef(kalikkum). Here word “athil” indicates Bhaaratham and “ithukaalam” indicates Kaliyugam. Calling God “Daivame” indirectly shows their sorrow and they wish that at least in their next birth, they will be fortunate to be born in Bhaaratha. Brahma Vaiavarttha Purana says: “satajanma tapa: puto janmedam Bhaarate labhet” means “after performing austerities for hundreds of births, one is born in Bhaarahta Varsha”. So poet is indirectly telling us that even after getting a human birth in Bhaaratha, it is really unfortunate for some one to forget God and waste his life going after material pleasures. In Kaliyuga Bhaaratha, attaining salvation is as easy as chanting divine naamaas. What is the use of being born as a blade of grass? Sometimes even a blade of grass that is growing near sajjanaas may get a chance to hear divine names of Bhagavaan and may be born as a pious human being and eventually attain salvation. There is a story about Poonthanam himself. There were two jack fruit trees in the poet’s back yard and those trees were very fortunate to hear Namasankeerthanam and Bhagavatha paaraynam (reading) by Poonthanam for several years. Once Poonthanam wanted to write about Vaikundham (Vishnu Bhagavan’s eternal abode) and he was worried how he could realistically describe Vaikundham when he had not actually seen it. That night Bhagavan gave him a real vision of Vaikundham and in that vision or dream two resident devotees of Vaikundham showed special hospitality with lot of affection. They told him that they were the jack fruit trees in his back yard which broke and fell a few days ago due to severe wind and rain. Since they were lucky to have satsangam with Poonthaanam for several years, they attained salvation. Poonthaanam was very surprised to see that even trees can get salvation by listening to Naama sankeerthanam and stories of Bhagavaan. This story justifies the desire of the people in other worlds to be at least born as a blade of grass in Kaliyuga Bhaaratha. People in the other worlds not only wish to be born here but they actually bow with respect and folded hands to all who are born here. Poet is telling this to us to remind how lucky we are and we should start naamsankeerthanam with utmost devotion with out a moment’s delay. God has blessed us to be born in Kaliyuga Bhaaratha and (even if we are not born in Bhaaratha,) Namasankeerthanam will purify our mind and satsangam will elevate us to higher states of spirituality. Chuttu thinnunnu janmam pazhuthe naam! Why should we tell that others are praising us like this? (first two lines ) Don’t we know that this kaalam is Kaliyugam, this land is Bhaaratham and we are all human beings? (lines three, four and five) Are we short of Hari’s or Bhagavan’s names? Are we not afraid of different types of hells? Are we born with out tongue in this janma? Do we believe that we will never be perished? (line seven, eight, nine and ten) We all should think about this in detail (chemme nannai niroopippinellaarum- line six). Alas! alas! (kashtam! Kashtam!) with out proper contemplation (niroopanam kootaathe) we are wasting our lives in vain (last line). In this stanza poet blames us for wasting our precious lives by going after transient pleasures. He asks: what is the use of saying over and over again about how people in the other worlds praise us? We do not deserve any respect from anybody unless we live up to the expectations of those people and our own mother land. They pay respect to us thinking that we are fortunate to be born in this punya karmakshethra and we will make use of the great opportunity God bestowed on us. Poet is wondering what is wrong with all of us! We are intelligent enough to know from the scriptures that this is Kaliyuga and it is easy to attain salvation in Kaliiyuga Bhaaratha just by doing Naamasankeerthanam. Kali Santharanopanishad tells us explicitly that in Kaliyuga only Naamasankeerthanam is the solution to all problems. (“Kalau naasthyeva naasthyeva naasthyeva gathiranyadha”) Why are we hesitating to chant Naamas? Is there any shortage of divine names? 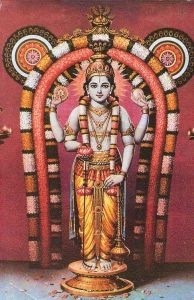 Vishnu shasranaamam has thousand names and we can choose any one that appeals to our mind. We can choose the simple “Rama” namam or a complicated one like “Vishvaksena”. Are we not afraid of the sufferings in the hell? If we are not afraid of hell, we should not desire heaven also. We should have “samabhaavana” or we should see both sukham (happiness) and dukham (sorrow) alike. Are we not afraid of the fruits of bad karmaas? Bad Karmaas will only give rise to suffering. Why are we going deep into the samsaara (materialism) by sowing wrong seeds and still expect to reap good fruits? Why is the tongue that is used for non-stop talking become hesitant to chant divine names of Bhagavan? We act as if we do not have tongue when it comes to Naamasankeerthanam. We are shy to chant loudly because of the powerful ego. But don’t we have the power of discrimination (bestowed on us by Lord) to know that once namasankeerthanam is started, power of naamam will easily take over the power of ego and our mind will get purified. Do we think that our body is eternal? If we realize how uncertain our life is and if we contemplate how helpless we are when death comes and knocks on our door, we should not waste not even one moment of our life. He sympathizes with those people who completely forget about this truth and wastes their life going after transient material pleasures with out ever turning their mind towards God. In this context, let us remember what Sage Narada asked Bhagavan and Bhagavaan’s reply. Sage Narada asked Lord where His permanent abode was. Is it Vaikundham? Is it Golokam? Is it Bhoomi? Bhagavan said: “Naham vasami Vaikundhe, Na yogi hrudaye ravau, Math bhaktha: yathra gaayanthi thathra thishtaami Narada” – he would not reside in Vaikunta, the celestial abode, nor in the hearts of great tapasvis [sages], nor permeate in the Solar system, but would stand in attention wherever His devotees do sing His name [sankeertanam]. How many previous lives (Ethra janmam) we struggled (prayaasappettittu) to be born in this time(ikkaalam) and because of the good deeds done in the past ((sukruthangal) we are born here (athravannu pirannu). How many lives we would have spent in human and animal excretions, how many lives we would have spent in water (line three and four), how many lives we would have spent in mud, how many lives we would have spent as trees (lines five and six), how many times we died, how many lives we would have spent flying in the sky as a bird (lines seven and eight), how many lives we would have spent as cows and other animals before we took birth as a human being (lines nine and ten)? The word “ikkaalam” or “this time” refers to Kaliyuga and word “athra” indicates Bhaaratham. First line says that only after several lives of suffering and struggle one gets the opportunity to be born in this Kaliyuga. Birth in Kaliyuga is considered to be very near “Moksha praapthi” or getting salvation because even the mere chanting of naamam leads us to moksham. Poet also says that only good deeds performed in the past make one eligible to be born in Bhaaratham. Even the inhabitants of heaven want to be born in Kaliyuga Bhaaratha so that they can free themselves from the repeated cycle of birth and death by performing “Nishkaama Karma” or karmaas with renunciation of results. Results of the accumulated good karmaas and bad karmaas that can be experienced by the subtle body are experienced in heavens and hells respectively. So, to take birth in Bhaaratha, one should have accumulated some good deeds in the previous janmaas, results of which can only be experienced by a human body born in Bhaaratha. 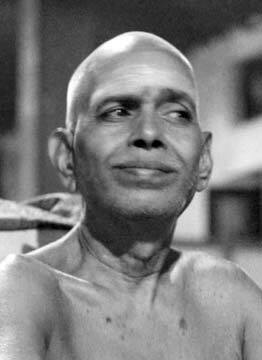 So poet says that it is a very unique opportunity to get a life in Kaliyuga in Bhaaratha. Before getting here, we do not know how many lives we lived as amoebas, worms and small insects in animal and human excretions. After that we may have promoted to the state of inhabitants of water. Even there, as a small fish we would have lived with fear of larger fishes. Then we might have spent miserable lives in mud in constant fear of being consumed by birds and other larger and cruel animals. Afterwards, we might have spent lives as trees suffering rain and shine and heat and cold. How many times our subtle body would have experienced the time lapse between one death and next birth? That time might have been filled with horrifying experiences in the hell owing to the sins committed. Who knows how many lives we would have spent as animals knowing nothing better than “animal instinct’? It is interesting to note the effect of fall from human life when compared to the effect of fall or going backward from lives of lower species. Let us take the example of a high rise building with, say, 40 storeys. Imagine fortieth storey is where Jeevathma merges with Parmaathma. Imagine that we climbed the first two stories and we happen to fall. The impact and momentum of the fall will be less than the fall from any higher stories of the building or in other words, the impact will be directly proportional to the height of the building. Scriptures say that in the spiritual world also the effect of the fall from highest species, human beings are much more serious than falling from other species. The reason is that human beings are blessed with the power of discrimination or vivekam and animal species are guided only by instincts. Other living beings like trees also have no choice other than following the commands of Prakruthi or Nature. When we choose wrong direction deliberately ignoring our ever guiding conscience, repercussions are disastrous. Animals are just experiencing the results of the past karmaas and after exhausting those through several janmaas in different species and kinds, finally gets the chance to be born as a human being. Poet says that human life is so precious and sought after by souls in all other worlds that we should cherish every moment of our life and devote it for knowing God by any prescribed method. In Kaliyuga the prescribed method is Naamasankeerthanam. In this context, it is appropriate to remember the one sloka from Mukundamala to reinforce the importance of Shri Poonthaanam’s advice. “The greatest wonder in human society is this: People reject the life-giving nectar of Bhagavaan’s names and instead drink poison by speaking about everything else”. Please understand or know (arinjaalum) that after a lot of struggle and effort (ethrayum panippettingu), finally we come or end up in a human mother’s womb (garbhapaathratthil veenathu). Ten months we survive in her womb (patthu maasam vyattil kazhinju poy) and about ten to twelve years we spend in childhood (patthu pantheerantuunniyaayyittum poy) . Rest of the life (pinnedam) we live identifying the body as “I” (thannetthaanabhimaanichu) (separate from Paramaathma) and with out really knowing who we are (thannethaanariyaathe kazhiyunnu). As explained in the previous stanza, after spending several janmaas in different animal forms, a soul gets a unique chance to be born as a human and takes birth in a mother’s womb. It is said that the baby in the womb remembers all the previous janmas. During the ten months of pregnancy, the baby is trapped inside the womb with no space to move around and during that time it contemplates about his existence and promises God to lead a life completely surrendering to Him when he gets out of the womb. But during of the trauma of birth, memory of the previous janmaas are completely wiped out and the baby becomes a slave of Maya. Here the poet says “patthumaasam vayattil kazhinju poy” and this indicates that even though the child remembered and took decision to lead a detached life with attachment only to God, all the good intentions were lost during his arrival on earth.So poet describes that as a waste of time or loss of time. Then the next ten to twelve years are spent as a playful child. Here also the word “poy” at the end of line four indicates the loss of his childhood years doing nothing to move towards God. When the baby is born he forgets about all the sufferings of the past janmaas and then starts building attachment to material things and relations influenced by the parents. Each day baby gets attached more and more to the people and things around him. If the parents do not teach him to think of God and surrender to God in the form of prayers, then the unfortunate child will never get a chance to remember or follow what he had promised God when he was in the womb. Swami Vivekananda stresses the importance of parent’s role in reminding the children, their hidden love and attachment for God through daily prayers. So parents can lessen the loss of precious time as a child by giving them the faith in God which they will carry all through their life. This faith in God and love of God given during the childhood years will help them to use their precious time as adults in youth and old age more effectively to advance spiritually amidst their other material commitments. Fifth line says that the rest of the life we live with terrible ego with out the real knowledge of who we are. So in our youth, we forget ourselves and take credit for all the success we meet with and blame others for every failures we encounter. So youth also is lost with out any contemplation about our own existence and we go after transient material pleasures. When one spends almost all of one’s life with out ever thinking of a higher power who controls everything in the universe, at the fag end of life one gets depressed and confused by the material world. Because of the lack of training of the mind to think and surrender to God, we get lost in the material world. Thus the most precious human life we obtained after a lot of struggle is wasted, ready to repeat the never ending cycle of birth and death. Poet says that God gives us a chance to escape from this and it is unfortunate that we are not making use of the golden opportunity given to us. I happened to read an explanation by an unknown author about the word “soham” and ego and I would like to share that in this context. What does “soham” mean? Sa: means He, That or God and Ham means “I”. Poet says that we live all our life and die with out this spiritual awareness “soham”. That is the meaning of the last line. What is the method to know ourselves or to identify ourselves with Parmaathma for materialistic people like us in Kaliyuga? Poonthaanam has one and only one solution: Naamasankeerthanam. This solution is easily accessible to all sadhakaas or yearning devotees and can be practised anywhere at anytime . One does not need any initiation or training.